A critical bug identified in the last minute delayed the final release for several hours but the bug has been fixed and Ubuntu 18.04 LTS is finally released. But before you rush off to download a copy be sure to swat up on all the new Ubuntu 18.04 features, changes and improvements this release brings – because honestly there are there a lot of changes. You probably already know that Unity is no longer the default desktop environment for Ubuntu anymore. 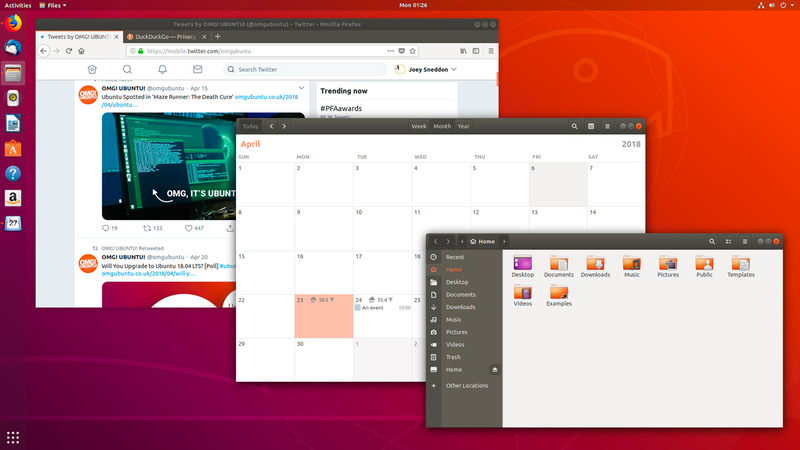 A customized GNOME version was introduced in Ubuntu 17.10. Ubuntu 18.04 will keep the same trend and will feature the latest GNOME (i.e., version 3.28) at the time of the release. Canonical has promised better boot speed in Ubuntu 18.04. Using systemd’s features, bottlenecks will be identified and tackled to boot Bionic as quickly as possible. You’ll see a new ‘minimal installation’ option when you do a fresh install of Ubuntu 18.04. This minimal installation is nothing but the regular Ubuntu install without most of the regular software. You’ll just get a web browser and a handful of utilities. People who like their operating system clean of bloatware and prefer to install applications of their choice may like and use this option. For as long as I remember, installing applications via PPA involves three lines of commands. First for adding the new repository, second to update the system so that it knows about the new repository and the third one to install the application. Ubuntu 18.04 is removing the redundancy here. Now if you add a new repository with add-apt-repository command, it will run the apt-get update command automatically. No need for you to run this command manually. Saves some time, doesn’t it? Ubuntu 18.04 was initially planned to have Linux Kernel 4.14 LTS. But lately, Kernel team shared that will converge on Kernel 4.15 for the Bionic Beaver 18.04 LTS release. Ubuntu has slightly changed the interface of Nautilus File Manager to make it aesthetically more pleasing. The left side pane is now dark and the icons are separately placed in the leftmost column. I think this is the first time in the history that Ubuntu has a welcome screen. It’s actually Ubuntu-fied version of GNOME welcome screen. The welcome screen provides a quick glance over ‘what is where’ so that Unity users won’t be confused. You can also opt out of the data collection (discussed in a later section) at this welcome screen. Help pages have also been improved and now show how to do basic things in GNOME desktop. Ubuntu has been criticized in the past for including Amazon web app and online search by default in the past. But it has not deterred Canonical from taking another controversial decision. Ubuntu 18.04 will be collecting some system usage data unless you choose to opt out of it. The result of the data thus collected will be available to the public for analytical purposes. Until now, Ubuntu has used Debian’s text-based installer for its server editions. However, the server edition of Ubuntu 18.04 will use the new subiquity installer. Dustin Kirkland of Canonical showcased the installer in a blog post. Ubuntu 18.04 will provide native support for color emojis by default. Until now, only monochrome emojis are supported out of the box on Ubuntu. You can do some tweaking and get color emojis even today but default support will always be better. Ubuntu will be using the same open source emojis that are being used on Android. Does it mean we’ll have the ‘wrong burger emoji‘ in Ubuntu? There has been no significant change in the default Ambiance theme of Ubuntu for years. It looks more or less the same in last several Ubuntu releases. This is why Canonical has initiated a collaborative project to develop a new theme set for Ubuntu 18.04 with contribution from the community. If you are interested in helping Ubuntu in developing its new theme, then do check out the details. Initially, the new GTK theme and icons set were supposed to be the default in Ubuntu 18.04. Since the theme and icon set is not well tested yet, Canonical dropped the idea. This new community theme will be available as an option in Ubuntu 18.04 and will become the default theme in Ubuntu 18.10. Kernel live patching is an essential feature on Linux server. Basically, you install a critical Linux kernel update without rebooting the system. This saves downtime on servers. You can achieve the same in command line on the desktop too. However, Ubuntu 18.04 makes it easier for you. You’ll find a new option of enabling live patching in the Software & Updates. Do note that you need to have an Ubuntu One account in order to use this feature. You cannot use live patching on more than three devices with one Ubuntu One account. I know this may sound silly that I included the new set of wallpapers in the list of Ubuntu 18.04 features. But keep in mind that it’s been a tradition at Ubuntu to invite entries from users across the globe and then select the wallpapers based on the public and jury vote. Note that these are the default wallpapers of Ubuntu 18.04 GNOME flavor. Other flavors have their own set of default wallpapers. You can no longer encrypt just the home option using ecryptfs-utils at the time of installation. It is recommended to use full-disk encryption instead. If you are already using an Ubuntu version, you MAY be able to upgrade to Ubuntu 18.04 without reinstalling the operating system. The upgrade procedure is mainly painless and all you have to do is to follow the on-screen suggestions. You must have a good internet connection though. The steps mentioned here apply to all official flavors of Ubuntu such as Xubuntu, Kubuntu, etc. It is also applicable to the Ubuntu server editions. Let’s see what the options to get Ubuntu 18.04 from your existing Ubuntu version are. You cannot upgrade to 18.04 LTS from 14.04 LTS directly. You must upgrade 14.04 to 16.04 first and then to 18.04. You can also choose to keep your system to 16.04 if you don’t want to do a double upgrade. To get notified of a newer version, make sure that you have the “notify me for a new Ubuntu version” option has been set to “For long-term support versions”. If you are using Ubuntu 16.04 which is a long-term support release, you won’t get notified of the availability of Ubuntu 18.04 immediately after its release. Canonical prefers to notify an existing LTS version about the availability of a new LTS version after a month. Ubuntu sees a point release in a couple of months that provides the bug fixes to common issues that have been noticed in the new LTS release. This way, the system running the older LTS version remains stable after upgrading to the newer LTS version. In other words, most Ubuntu 16.04 systems will be notified of the upgrade when Ubuntu 18.04.1 is released. Just make sure that you have the “notify me for a new Ubuntu version” option has been set to “For long-term support versions”. You should not be using these Ubuntu versions because 15.10, 16.10 and 17.04 have already reached their end of life. This means you are not getting any security and system updates. If you are using Ubuntu 17.04, you can upgrade to 17.10 and then upgrade to 18.04. Personally, I don’t advise doing a double upgrade. It is better to do an external backup and do a fresh install of Ubuntu 18.04. If you are using Ubuntu 15.10, 16.10 or other older versions (excluding 14.04 and 16.04), you will have a really tough time upgrading to 18.04 even if you plan to do a series of upgrades. It is because the immediate higher version for them has already reached the end of life. And thus you’ll have to change the repositories to the newer version manually. Not everyone will be comfortable doing that and hence I advise a fresh install of Ubuntu 18.04 for these versions. As an Ubuntu 17.10 user, you have the choice to upgrade to Ubuntu 18.04, both final and the beta version. I would still advise waiting for the final release on the 26th April for upgrading to Ubuntu 18.04 though. If you are willing to experiment, you can upgrade to the beta version of Ubuntu 18.04 right away. You can follow the video below or the steps mentioned after it. Go to Software & Updates -> Updates. Here, make sure that Notify me of a new version is set to For any new version. Also, check the option of pre-released updates. This will run the Update Manager and it will notify you of availability of Ubuntu 18.04. You can follow the on-screen instructions from here onwards.